Another update of Patternodes 2 is now available for download. The main focus of this update is further usability improvements to make it easier to work with and understand the software. One big improvement is you can now drag and drop files into the node editor or into import nodes, and life will be a little easier for one-button mouse users as you can now use either left or right click on connections to access the connection menu. Most of the changes hoewever relate in one way or the other to the dynamic repeater elements feature, and aim at making this easier to use and understand. Now all repeater indexes will be available all the time, and dynamic elements will be enabled by default if you connect repeater or element parameters to something dynamic (like an index or random value). The connection previews also now show the number of iterations generated for dynamic elements that are generated multiple times. Drag and drop support for importing files into the node editor or into an existing Element Import node. Left-click now also brings up the connection context menus, with better visual hover feedback. Fixes and improvements to dynamic element repeater functionality. You can now zoom the preview with option (alt) scroll wheel, and you can scroll a little beyond the edge of your artboard. The node connection preview now shows number of generations for dynamic elements. Improved performance and memory management. The Custom Loop repeater node is deprecated and will soon be removed (use other repeater dynamic elements and indexes instead). 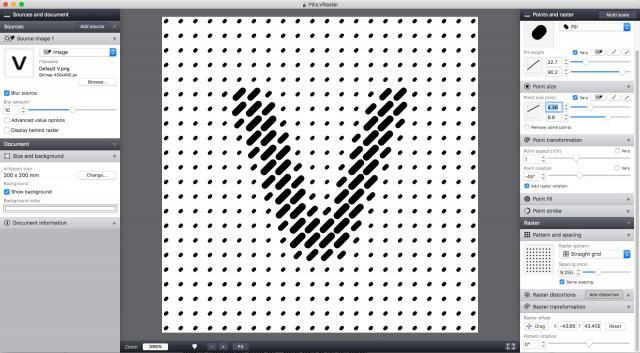 The vector halftone and pattern app Vectoraster 7 has been updated today. The new version fixes some bugs and adds some small improvements, while also updating some under-the-hood frameworks to the latest version in preparation for the 7.4 update which is planned to bring some more substantial new features. Fixes some bugs related to changing document artboard size. 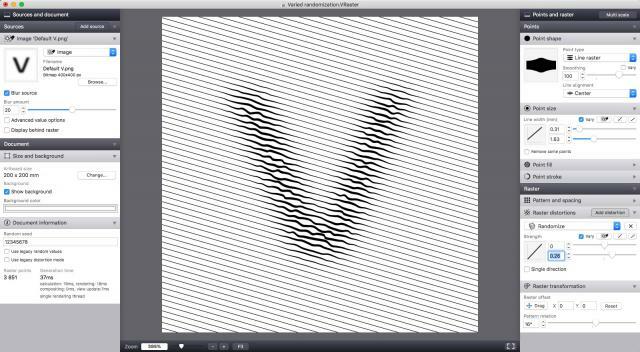 Fixes a bug with raster distortion strengths in imported Vectoraster 6 files. Updates to frameworks for updates, license handling and general macOS support. The recent influx of new Patternodes 2 users has meant a lot of new feedback and bug-reports have been coming in. So here's another update of Patternodes 2with further improvements and fixes. I think all users will notice some nice usability improvements when it comes to handling connections, previews and adding nodes on connections. While perhaps a little technical the most exiting to me is probably the new method for re-using random parameter values in dynamic elements by linking to parameters using random values. For example assigning a random size to elements and then assigning an opacity based on the size like in the example above. Improvements to adding and removing nodes on value or color connections. Improvements to connection preview (right-click connections) for graphics connections and color connections. You can now reuse the same random value by linking one parameter to a random value node, and then others to that parameter. A new sample file 'Reusing random values' showing this added. The Group Arrange node can now be applied to selected elements only and move these to the front or back of the group. In all change nodes apply to random selection now lets you offset this random selection. Re-structured and cleaned up the preferences panel, removing some old redundant settings. Updates to manual and sample files (Find them in the Help menu). Fixes a bug with the Align node align group elements left and top. Fixes a bug where math nodes converted from other value nodes would not work properly. Fixes a bug where automatic spacing calculations would not update automatically when the artboard size was changed by a connected value node. Fixes interface problems for macOS 10.14 users with dark mode. 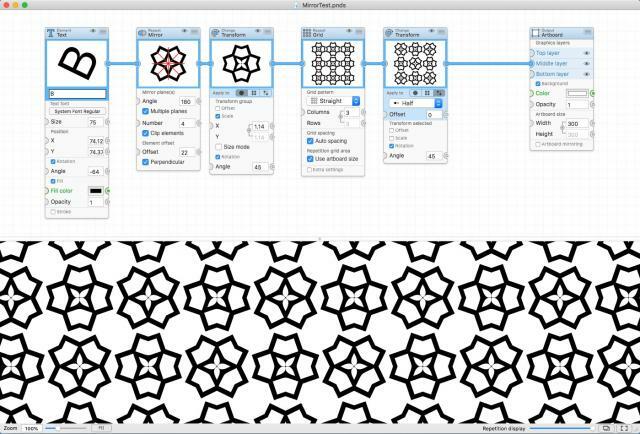 A new version of the node-based vector pattern and animation design application Patternodes has been released. The new version adds a bunch of small additions, fixes and improvements, and is now available as a free update for all users. The Arc wedge shape in the Element Shape Node can now be given an inner diameter. Rounded polygons and Star shapes in the Element Shape node can now get pointy negative rounding. Added support for relative adjustments in the Change Opacity and Change Stroke nodes. New context menu shortcuts on the Artboard node to apply preset artboard sizes. Improvements to node connection usability. Improvements to node placement when adding new nodes on connections. Fixes a bug with the Group Apply Function node, pivot distance mode for groups of element groups. Fixes a bug with incorrect first regeneration when toggling dynamic elements off and on in repeater nodes. Apple Hardened runtime security features. Another update to Vectoraster 7 released today. The new version fixes a couple of bugs we found after the last update and adds the support for negative shape smoothing values, letting you make new pointy shapes. While it might seem like a small change it also tweaks the way the parameter value sliders adjust their value range dynamically, which we think will be a major improvements to working with the software. The Smoothing parameter for polygon point shapes (and more) now accepts negative values, letting you make new pointy shapes. Improved adaptive value ranges for parameter sliders. New setting to toggle GPU accelerated interface rendering on/off. Default is on for retina macs. Fixes a bug with launching Vectoraster by double-clicking some .VRaster files. Today another update to Vectoraster 7 has been released. The new version primarily improves performance, both in rendering rasters and interface responsiveness in general, especially on macOS 10.14 systems and retina macs. There are also som bugfixes and new options in the Multi-scale utility to let you scale stroke parameters as well. Performance improvements, especially on macOS 10.14 and retina macs. 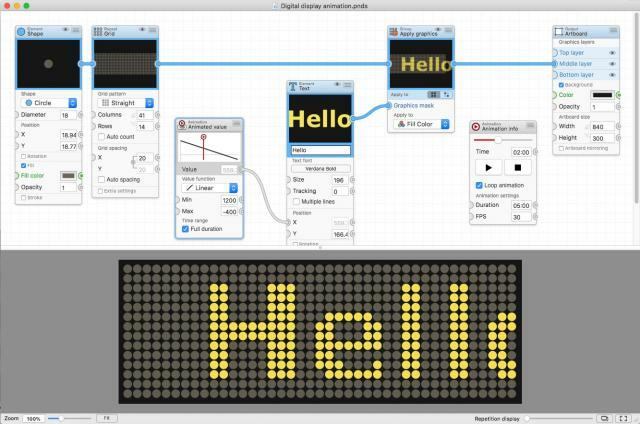 Multi-scale can now also scale point stroke along with pattern and point size. 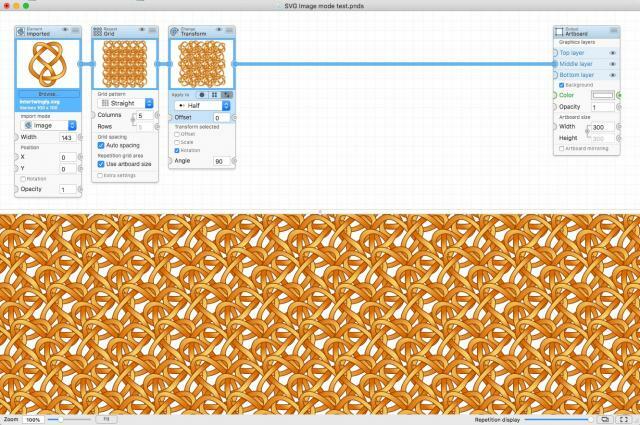 Fixes a bug with Multiscale not scaling radial raster patterns from the center. The disable interface animations setting now works as intended. Today a new update to the vector halftone and gradient software Vectoraster 7 has been released. The new version includes some under the hood fixes and improvements, along with new variable point parameters for stroke and fill color opacity. So now you can vary your raster points in yet another way. New variable point fill and stroke opacity parameters. Improvements to Finder quicklook previews and file thumbnails. Fixes some interface bugs on macOS 10.14. Fixes a rare network full version unlocking bug. Today another update of Patternodes has been released. The new version adds some improvements for finder previews (like icon thumbnails and sharper vector-previews for less complex graphics), and fixes some bugs. Update from within the application or download the new version and try it out free using the link below. Improvements to Finder previews and thumbnails for .pnds files. Fixes some problems with SVG exports. 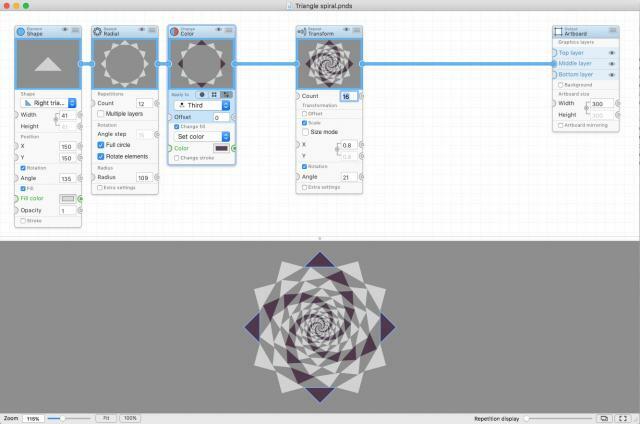 A new version of the node-based vector pattern and animation design application Patternodes has been released. The new version fixes a couple of bugs and adds some minor interface tweaks, but the main change is an overhaul of the rendering back-end. This should result in better performance and stability, and a more stable foundation to build future update on. Performance improvements with new multithreaded rendering backend. Improvements to preview zooming and panning. You can now click/drag in animated value node graphs to change the current animation time. New and updated sample files (accessed from Help menu). Fixes some bugs with element clipping path rendering. Fixes some bugs with group-index based generation. Fixes some control clipping bugs on macOS 10.14. 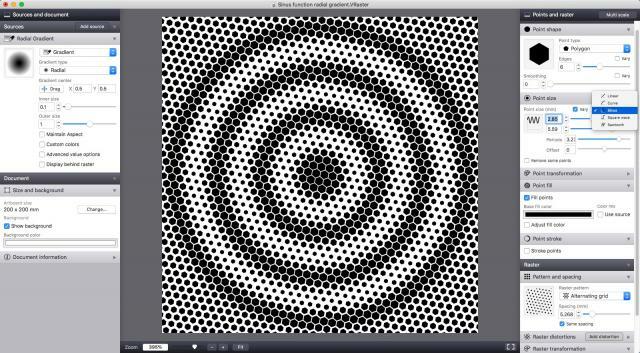 Today a new update to the vector halftone generator Vectoraster 7 was released. The new version comes with the usual set of little fixes and tweaks, along with some more substantial new features related to how you can use gradient sources (and others) to vary different point properties with new periodic functions. New varied parameter functions: Sinus, Square wave and Sawtooth, with variable periods and offset. New varied parameter sources: Position X and Y, letting you easily vary any property based on position without needing to make a new Gradient Source. Improved Gradient source precision and performance. Updates to license entry and trial-mode interfaces. Bug fixes to precision angle parameter inputs. The new version is now available as an update in the application, or to download and try out for free. 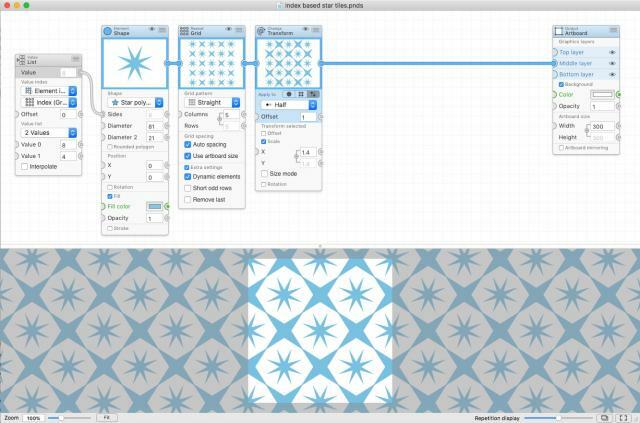 Today a new update to the graphic pattern and animation tool Patternodes 2 was released. The new version is available for download here on the site for new users, or as an update in the application for existing users. Imported SVG image elments can now be used in Image mode as well as Path mode. Further improved SVG vector path importing. Another update of Vectoraster 7 has now been released, you can download the new version for free here or update from within the application. New Custom shape point Image mode and Path mode for more options with imported point graphics. Improved SVG rendering support for both source images and custom shapes in image mode. 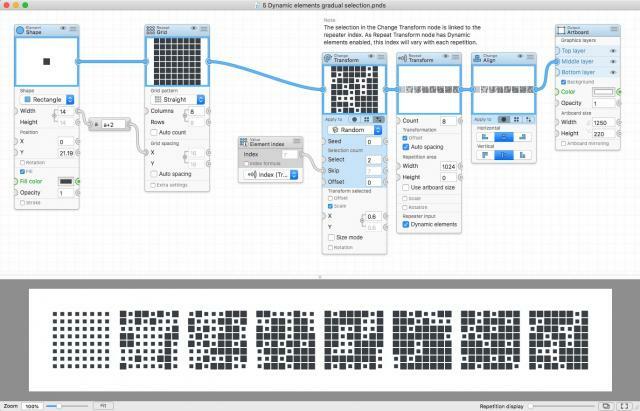 Today a new update to the node-based vector graphics tool Patternodes 2 was released with some new features, fixes and improvements. New Repeat Mirror node that mirrors and clips elements to with one or more mirror planes. Improved SVG vector path importing. Exported MPEG4 animations now get the default file extesion .mp4 instead of .mepeg4. Fixes some problems caused by setting a 0x0 artboard size. Fixes node preview display bug with element performance caching disabled. Improved diagnostics for some installation and network problems. Vectoraster 7 has now been updated to version 7.3.2, you can download the new version for free here or update from within the application. Improved custom shape SVG path parsing. Interface improvements for point color picking and source mixing. Support for upcoming macOS 10.14 mojave. Patternodes 2 August sale, 50% off! The node-based parametric vector pattern and animation tool Patternodes 2 is now on sale, 50% off the regular price during August. So if you're looking for something new to try out during those long (or too short) summer days, now's a great time to check it out. Patternodes has now been updated to version 2.1.3. This update fixes some compatibility problems with macOS 10.11 and earlier, and fixes a bug with misalignment of selection outlines on retina macs. Vectoraster 7.3.1 has now been released. This update fixes some compatibility problems with macOS 10.11 introduced in the last update, so now hopefully everyone should be able to access the new features in Vectoraster 7.3. We've had some reports regarding problems with the latest updates of Vectoraster 7 and Patternodes 2 on systems running macOS 10.11 or earlier. While we're working on fixing these we've rolled back the initial download versions here on the site to the previous versions, and restricted updates to users with macOS 10.12 or later. This means the users with macOS 10.12 or later can still update and everything should work fine, but users with earlier macOS version can still use the products until the problem is fixed so they can update too. 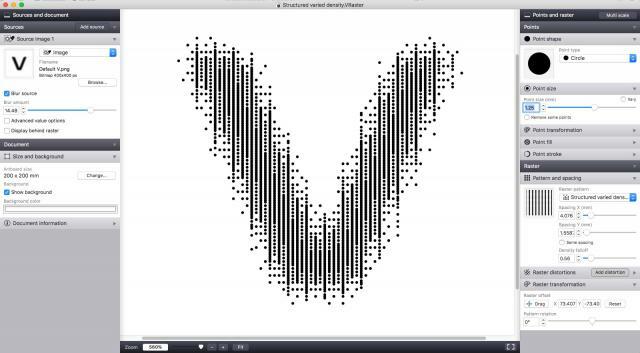 A new update of the vector halftone generator Vectoraster 7 has been released. This update add a number of improvements to line rasters and raster pattern distortions. Primarily it adds the possibility to vary distortions strength (like the amount of randomization or offset) with a source image or gradient. Download and try it out now or update from within the application. Raster distortions (like randomize) can now have their strength vary based on sources. 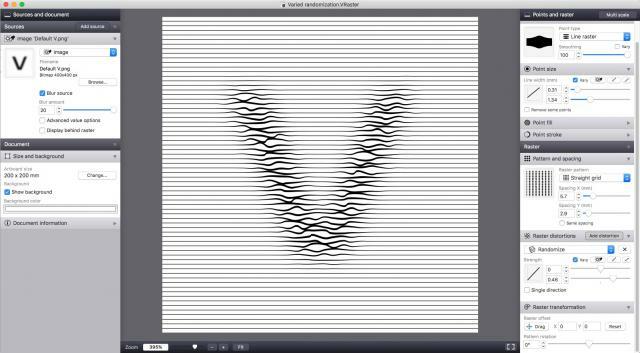 New Offset distortion to make use of the new possibilities with source-based distortions. Line rasters can now be aligned top/center/bottom. New double linear gradient source gradient mode. 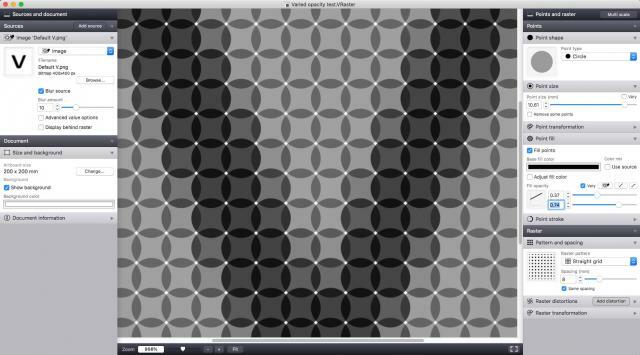 Varied density raster patterns now let you choose source to control the denisty. Randomize raster distortions can now be applied with better gradual control. Improvements to version checking and updating. Various small fixes and tweaks. Today another update to Patternodes 2 was released. This update brings some additional usability improvements and bugfixes. Math node formulas now let you edit constants in formulas using the hover control sliders, steppers etc like regular values. Improvements to node index selection controls. Fixed a bug with Group Apply Function node element selection offsets. Fixed a bug with adding clipping masks to transformed element groups. 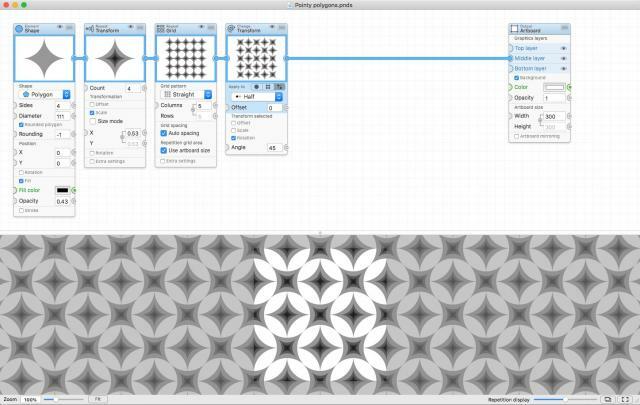 Today a new smaller update to Patternodes 2 was released. This update primarily fixes a couple of bugs in the 2.1.0 release. The new version also adds a new feature that highlights elements in the preview created or modified my the currently selected node. This doesn't affect export and you can turn it off in the settings if you don't want it, but hopefully it'l make it easier for everyone to keep track of what nodes apply to what elements. 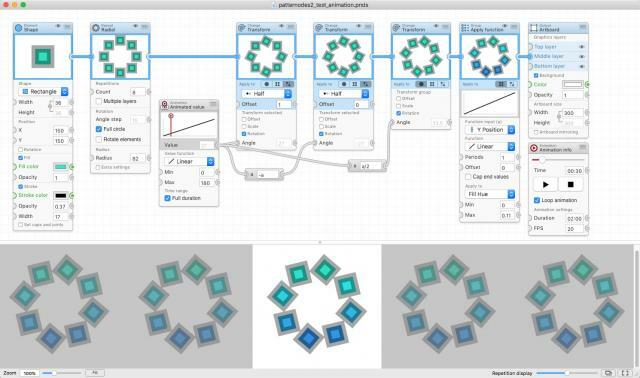 A new update to Patternodes 2 has now been released. This update adds a lot of new features making the dynamic elements and element index features more powerful, as well as adding a lot of other improvements along with a new Align node and some bug fixes. New Element Index node lets you access different repeater indexe values (like Row, Column etc) when using repeaters with dynamic elements enabled. New Align node lets you align elements in relation to the artboard or internally in a group. New Element list node allowing you to use different alternative elements in a dynamic repeater pattern. Improved Value List and Color List nodes, with built in element index modes and a new index offset parameter great for animating random or index-based value sets. Node connections now have drag handles at both ends by default, and there a new setting to control what ends have handles. The Repeat Transform node now has an Auto spacing mode, calculating spacing based on count and total repetition area similar to the Repeat Grid node. Option to skip frames in animation previews when rendering is slow. Math formula parameter fields can now be edited while a preview animation is running, just like value fields. Fixes a bug that could cause the value parameter hover controls to disappear in some situations. Fixes a bug that could cause tinted bitmap image elements to render at low resolution. Fixes a bug with pivot point adjustments for element groups. Website visits and downloads are tracked only on our own server using Matomo, no big-data/third party analytics or ads. This information is only used to track product popularity and discover problems on the website. Mac product purchases are handled by Paddle and we keep and maintain a database of your license information so that we know who owns the software. Mac product usage is tracked when unlocking and upgrading our mac products, we log these checks along with software and macOS versions to keep track of software usage and detect piracy attempts and problems with updates. In all these cases IP addresses are masked and no information is sold or shared with a third party. There are now links to this information in our software and on all our web pages, you can find out more detailed information below. A new update of Vectoraster 7 has been released. This update adds a new pill point shape you can use in your rasters, with variable length and size, along with all the usual other transformations. Adds SVG format export support, including animated SVG export of animations(!). Improved image quality (lower compression) in MOV and MPEG4 animation exports. Fixes a bug with centering arc path elements in the Change Pivot node. Fixes a bug with the Apply Function node horizontal/vertical mode used on rotated groups. Fixes a scaling bug in MOV, MPEG4 and GIF animation exports on retina macs. Improved node illustrations and descriptions in the built-in node reference guide. Some smaller fixes and adjustments in node interfaces. Improved configuration or structured and random varied density raster patterns. 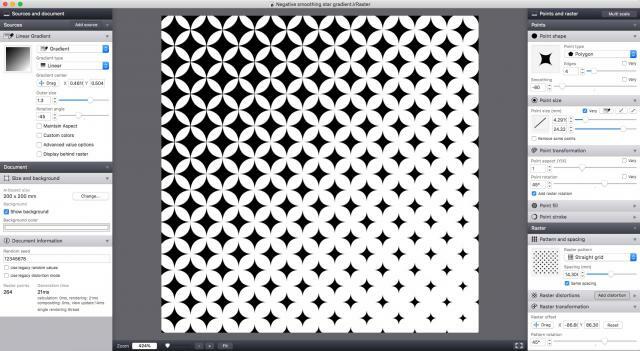 Letting you set a separate vertical spacing for these patterns, as shown above. Improvements to bitmap format export (TIFF, JPG, PNG), with better print size and resolution settings that are now properly stored in the exported image files. 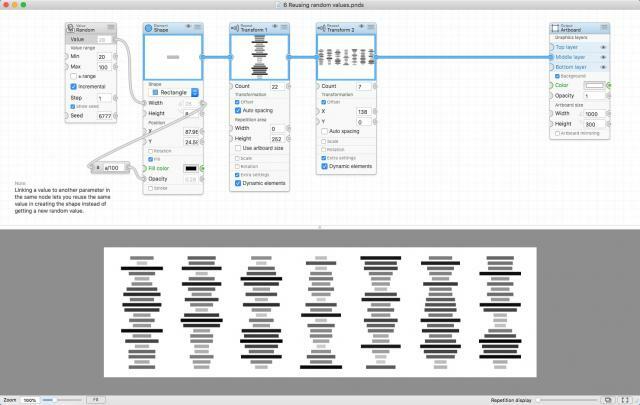 Today a small bug-fix update for the newly released Patternodes 2 has been published. Fixes a bug with the Make Seamless repeater in Demo mode on retina displays. Fixes a bug where pasting copied nodes from Patternodes 1 could cause problems. Improved node editor scrolling when dragging close to the edge.